The Nightmare of Frankenfish: Coming Soon to a Supermarket Near You! 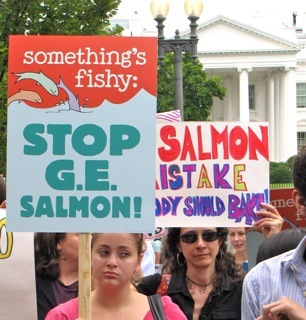 If approved, GE salmon would be the first “transgenic” animal allowed into our food supply. It’s also unlikely that it would have to be labeled, so you might not even know you’re eating it. 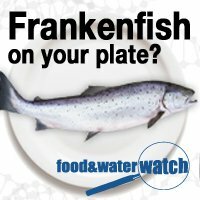 More details via Food & Water Watch's "Stop Frankenfish" campaign. 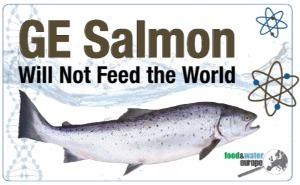 Read Food & Water Watch's briefing "GE Salmon Will Not Feed the World". And read "Frankenfish: How Genetically Engineered Salmon Could Hurt Our Health and Environment". 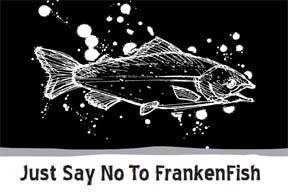 Watch the video "Stop Frankenfish"! 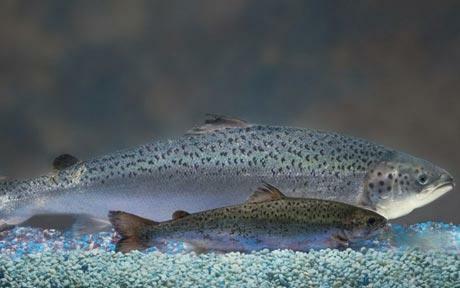 “We all know there is a great appetite for salmon, but the solution is not to ‘farm’ genetically engineered versions to put more on our dinner tables; the solution is to work to bring our wild salmon populations back” said Andrew Kimbrell, Executive Director for the Center for Food Safety. More details via "Frankenfish Salmon".